Hey its again Kiddy-chan with a 1600 wp. I saw the Scan, then i must made a wallpaper with this Pictures. 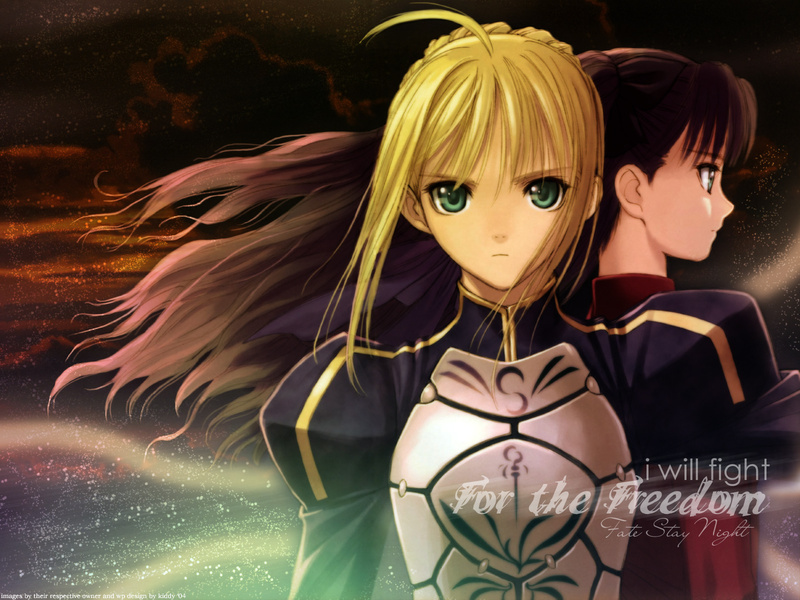 wooo~ awesome FSN wallpaper! <3 the scan and the text placement works well ^^ Good job desu! and the effects you use in this chase look extremely good! Not like this much. But still will download it. Really a nice wall! Il take this! hahaha! Thanks dude! Keep up the good work! I like how you blended the girl's hair on the left-hand side of the wall. It's subtle, but it makes the scene look more natural. dunno the anime at all....But I always love those kind of poses and the effects are nice and make it seems like a real breeze is blowing. I love this. Its big and good quality. I Like the dark color as well. Fate has lots of dark art in it. its got alot of popularity to. very interesting putting up a picture like this. I like it so much. Well, that plus the dark background makes a nice effect! Just to give you a warning, Fate/Stay Night is an H-game. Anyways, this is a really great wall of Saber and Rin. The effects are cool. It looks like Tony Taka did the character design on this one. The wallpaper turned out very nice. I like the character extraction and the background is a nice fit. Great job you did here and thanks for sharing.